Welcome to New York City’s most elite social scene. It’s made up of trust fund kids, twenty-something tech CEOs, and futurist entrepreneurs. It’s 2016: Billy MacFarland is securing millions from investment giants for Fyre Festival: an event he has no ability to materialise. But that doesn’t matter. Because somewhere along the way, the idea – the concept, the online image – has become more important than reality. This is the New York 24-year-old Anna steps into. Anyone following the Anna Delvey scandal will need no introduction to the play’s protagonist. 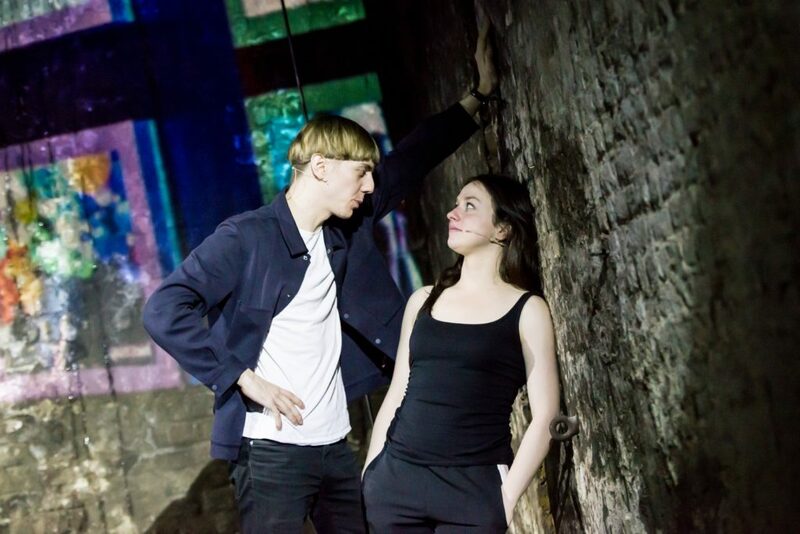 Written by Joseph Charlton and directed by Daniel Raggett, Anna X beautifully, articulately captures the “playground” of New York City, and the smart, ambitious young people hustling to play its games. Charlton’s script follows Anna (Rosie Sheehy), a mysterious Russian girl based on the real-life Delvey, who arrives in the city armed with designer clothes, intimidating knowledge of modern art, a lit Instagram, and stacks of $100s in cash. She is perfectly poised to infiltrate an echelon that knows next-to-nothing about art and fashion, but heaps value on those that do (or seem to). It’s rich soil for imposters, and Anna – who comes from nothing but claims she’s worth $60 million – flourishes. Charlton adds a second character, Ariel (Joshua James), an MIT grad with an idea for a dating app valued at $200 million. Although Ariel is fictional, he may be a good approximation of the sort of nouveau riche tech guys who would have been in Anna’s circle: her ‘friends’ who somehow always ended up with the bill at the end of her wild nights. The play’s use of projected media – displaying impressionistic cityscape backgrounds – creates an appropriately artistic and chaotic aesthetic. A brilliant opening scene has Anna and Ariel at an “immersive nightlife experience”, shouting to each other over blaring EDM. Their lines, obscured by the music, are projected on the wall for the audience to read. It’s an ingenious representation of the incomprehensible swirl of art and tech currently dominating New York’s trendiest scenes. Sheehy’s control of her character is phenomenal. With excellent command of the Russian accent, she fluently communicates Anna’s contempt for the people around her, while occasionally allowing a childlike brightness to shine through. Sheehy, perhaps like Anna, understands the aloof coldness, which may be common in eastern Europe, is disorienting enough to Americans to unbalance them. She effortlessly demonstrates that indifference in Alexander Wang sportswear is a magnetic kind of cool. James is excellent as the earnest Ariel. Together they have great chemistry, and easily power through the rapid, intense pace of the show. Although Anna may have harboured disdain for the socialites she conned, the play shows no animosity toward her. There’s real skill in Charlton’s ability to reveal the humanity under her manipulation. His play argues that Anna was trying to get ahead like anyone else. If her cunning took her higher than most, then it was that much further to fall.